Theresa's Mixed Nuts: Snack on No-Bake Crispy Treats This New Year's Eve! Snack on No-Bake Crispy Treats This New Year's Eve! To tell the truth, I am a wee bit tired of all the holiday baking. I am also a wee bit tired of all the sugar filled desserts that have been coming our way since Thanksgiving. The thought of biting into another cookie or piece of pie just makes my stomach churn. We do have New Year's Eve coming up in less than a week away, and I know that I have to have some sweet snacks on hand for our yearly night or competitive board game playing. I've been saving this No-Bake Crispy Treat recipe to try during the holidays, but I think it's perfect for New Year's instead. 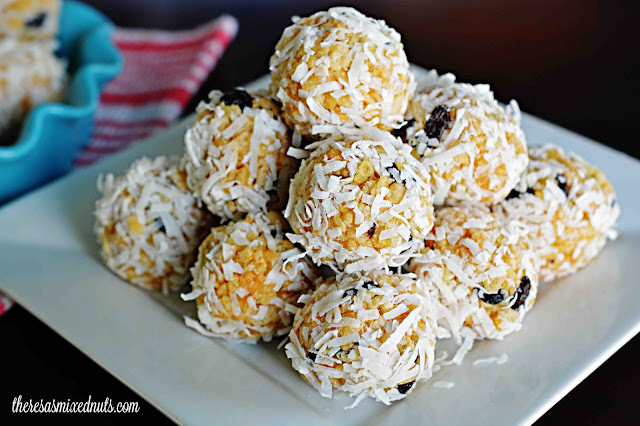 Sweetened with natural ingredients like honey, raisins, and coconut, and not a lick of cane sugar, makes it a great treat when you are trying to come down from the holiday sugar buzz you've been floating on for the past month. No-bake makes it that much more better! If you make these, I would recommend chilling in the fridge for about an hour before shaping into balls. Otherwise, they tend to be a bit too soft and don't hold the ball shape. I love little bite balls like this. I make ones filled with protein often for breakfast time. Looks nom! I do prefer them truffles and balls in which the butter is melted with sugar or honey on the stove before being mixed with the crispies. I love no bake snacks - they are so easy! I'm taking my dog to the vet on New Years Eve but that's my only plan so far. These sound delicious. No bake treats are always a hit. We usually take the kids to a movie and then go out to eat. It's our little tradition. Happy New Year! I bet I could make these using my Puffed Millet cereal. They do sound very good. No bake food is so awesome.. been pinning a lot of those haha. Hope you had a good rest this long Christmas weekend! Delicious. I'd love to try to make these. Even beyond New Year's Day! Those sound perfect for NY Eve or any day! They sound super yum! Wow, those look delicious! And I especially love the fact that they're no bake! Yes, me too. The no bake makes it so much easier. Those looks so good and presentable! Love it and I bet the honey just sweetens it up more! Oh these sound delicious. I could snack on them any time of day! I should try this out. No bake????!!! Wow these look amazing, we love Rice Krispie treats, I so need to make these. I've had so much sugar already this holiday season. But these look like i need to make these! These no bake crispy treats looks so delicious! I would make a batch of these and save them for a quick snack! These treats look so delicious and I love that they are no-bake. It's the perfect treat to enjoy with the kids. Yummy treats! I think I'm going to make these up and see if I can hide them from the kids. Keep them all to myself!!!! I am just loving this no bake recipe, which looks absolutely delicious. We have been using Golden Blossom at home for past few years & the ingredients makes it a healthy recipe over all. And no bake means you can eat it that much faster too. Have a wonderful New Year's, dear Theresa. My nieces would go nuts for these! The fact that they are no bake is perfect for me. I'm tired of baking and I need a break. We will be trying these this weekend.